The V200 is a great entry-level option. The captured resolution and colour representation are excellent for our needs. It handles colour, black-and-white photos and text documents well. The lid is also placed on a rising hinge to help get thick books or wide margins onto the glass plate. You only have four buttons to control, though mostly we just used EpsonScan software to capture the image. It's a very simple system. The Epson software bundle has always been very able. It now includes such treats as Auto Photo Orientation, which corrects wayward positioning, and a new auto-cropping feature that lets you throw two photos onto the plate, scan once, but get two separate files back. This is a great timesaver. 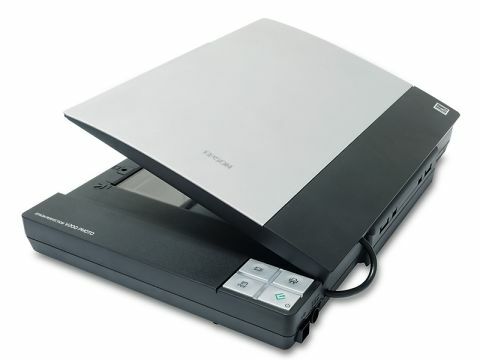 One problem we had in the past was the noise Epson scanners made while scanning (not unlike loading software from a cassette tape). This issue has thankfully not lingered too badly in the Epson V200, which performed reasonably quietly for us. You need to have realistic speed expectations for a scanner of this size and price. Speed is generally excellent for photos and documents; you get a preview back in eight seconds, and 300dpi A4 colour scans in 15 seconds. Scanners like this are much slower at scanning film; to do the job right you need to set a higher resolution, and this bogs the scanner right down. Our strip of four negatives scanned at 2,400dpi took just under six minutes to scan, which is quite slow. If you have bags of them to scan, you'd be better off with Epson's V750. For more basic scanning, though, you can't knock the V200.